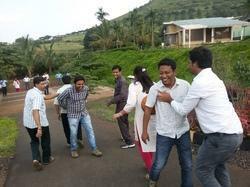 Outbound Training is a training method for enhancing organizational performance through experiential learning. outbound training activities help develop, sharpen and fine tune behavioral skills and qualities of a person. They help people get rid of their fears and bring out the hidden traits of personality. These activities form a great platform for confidence building, team bonding and personality enhancement. Participants agree to collaborate and take the responsibility of their own learning. Through initiative and willingness to take part, players join in to push their own intellectual, psychological , social and emotional boundaries. We are passionate about Training! Over 20, 000 participants (in the batches of 15 – 20 per program!) from renowned companies have been benefitted through our Training programs. Experiential learning is the best form of learning in the world. The most unique statement of outbound training is that the participants can directly find their strength, weakness and a chance to rectify themselves by Quality Improvement Programme. Top 10 Reasons Why this is the best location for all your Outbound Training Program requirements. 1. Located just 2 Hours drive from Mumbai and Pune. 2. Two Conference Halls measuring 600 sq ft and 1300 sq.ft. 3. Accommodation At The Resort In variety of Cottages and Rooms. 4. Inhouse Rock climbing wall. We offer tailor made courses to meet the requirements of your organization. We deliver development programs that are engaging, memorable and achieve real improvements in performance. Come discover a new you, recharge your employees, work outdoors. In today's corporate world, the need of the hour is for strategic thinking, swift action and effective people skills - qualities that are more effectively developed in an experiential setting than through classroom training. A company cannot become world class if the people working in the company are working in silos. A good team makes a good company and to keep the team well bonded, team building exercises are very important for companies today. In this hectic world of business, team management, team composition and team building is very important. A good team makes a good company and to keep a team gelled, team- building exercises became a part of every major company's agenda.